This film is a part of a Double Feature with The Lady Vanishes. When two movies that are screening in the same theatre are grouped under the same thematic heading, one ticket is good for both features when viewed back-to-back on the same day (except as noted). Ray Milland, Grace Kelly, and Robert Cummings. Though shot on 3-D cameras, this film was ultimately released in most theaters in 2-D due to the public’s loss of interest in the technology. 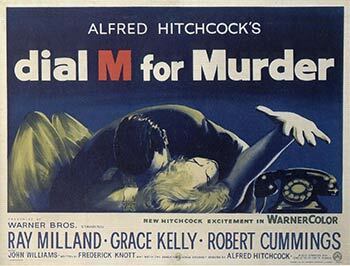 Of course, Hitchcock only ever needed two dimensions to thrill us, and he proves that point again here with a cracking yarn about a man who discovers his wife’s affair and cooks up a plan to have her murdered.